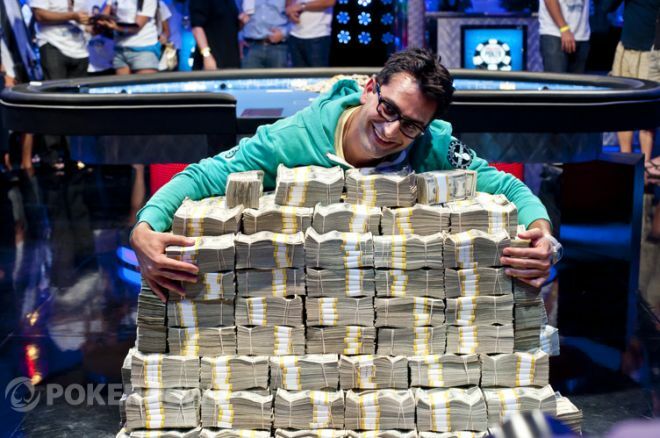 On Tuesday, Antonio “The Magician” Esfandiari won the single largest prize in sports history and the first platinum bracelet in Event #55: $1,000,000 Big One for One Drop at the 2012 World Series of Poker. The last day of this extraordinary tournament saw some of the biggest names in poker facing off against some of the wealthiest, and most talented, amateurs in an epic battle to see who would be crowned the winner of poker’s first $1 million buy-in WSOP event. 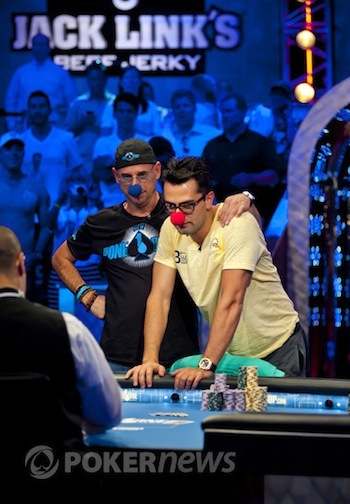 In the end, Esfandiari took down the top prize of $18,346,673 after defeating England’s Sam Trickett. Esfandiari and Trickett were first and second in chips coming into the final table, and they stayed the top two throughout the day. Esfandiari had most of the momentum and almost ran away with the tournament but for one hiccup, where he doubled up businessman David Einhorn early on with pocket kings versus pocket aces. Richard Yong came into the day as one of the shorter stacks and never was able to get any momentum. In Hand #17, he made a move, three-betting preflop, but folded to the all-in of Esfandiari, which left him with under 4 million. He shoved the last of his chips from the hijack seat and play folded to Brian Rast in the small blind. He three bet all-in to isolate Yong and the cards were turned up. Yong had a slight lead, to the of Rast. He held the lead through the turn with the board showing but the river was the and Yong was the eighth place finisher. 1978 WSOP Main Event champion Bobby Baldwin was given a miracle double up in a hand against Guy Laliberté, which kept him alive long enough to make it to the dinner break. But he could not get lucky a second time, and ended up going out in seventh place with against the of Laliberté on a board. When the field was six-handed, there was a huge divide amongst the remaining players. Einhorn was the shortest stack and Phil Hellmuth and Rast were also riding short stacks, while most of the chips were clustered among the top three, Esfandiari, Trickett and Laliberté. With such a large disparity in the payout between sixth place and second, the shorter stacks would need a double up soon to be competitive. Rast looked to have the ideal situation to move up in a hand against Trickett, but it instead was a brutal send off for the winner of the 2011 $50K Poker Players Championship. Trickett had opened to 1.2 million from under-the-gun, Rast called from the button, and Esfandiari called from the big blind. The flop fell , Esfandiari checked, Trickett fired 1.8 million, Rast called, and Esfandiari folded. The turn was the and Trickett bet 3.8 million. Rast called. After the fell on the river, Trickett tanked before moving all-in. Rast snap-called and turned over for a flopped flush. But Trickett showed for quad threes, knocking a stunned Rast out in sixth place and giving Trickett the chip lead for the first time. Esfandiari reclaimed the chip lead in a large pot against Trickett where he called Trickett’s preflop four-bet, then check-called him on the flop and turn before they both checked down the river. With the board reading , Trickett showed for a pair of eights, but Esfandiari's was the winner. From there, he never looked back. Guy Laliberté had been third in chips for most of the day, but his chance to win the tournament he had dreamed up and orchestrated ended in dramatic style. He had three-bet to five million from the button, Esfandiari four-bet from the big blind to 12.3 million and Trickett folded. Laliberté moved all-in for over 25 million quickly and Esfandiari create a mammoth pot of over 50 million. Laliberté was ahead with to Esfandiari’s . The creator of Cirque du Soleil and the player nicknamed “the Magician” each donned clown noses and stood, arms entwined, waiting for the dealer to spread out the cards. The flop came down and Laliberté stayed in front with his queens. Then came the turn, and it was the and Esfandiari soared into the lead. Laliberté asked for a “one time” but the river was the and he was out in fifth place to the cheers of the crowd. After waiting as long as he could for a place to try for a double up, Hellmuth raised enough to make himself pot committed and Trickett came over the top all-in and Hellmuth called. Hellmuth had but Trickett was ahead with . The dealer was slow to turn over the flop, perhaps sensing what was to come. . Hellmuth flopped top two, but Trickett had the nut flush draw to add to queens for the win. The turn gave Trickett even more outs, when it brought the . And one of those outs came on the river — the for the straight, eliminating Hellmuth in fourth place. David Einhorn had about twenty times the big blind when play was three-handed and was the short stack. He won three of the next six hands, moving all-in preflop. But the fourth time he moved all-in, he was called by Esfandiari. Esfandiari was ahead with to Einhorn's and the board ran out . Einhorn was out in third with $4,352,000. This was Einhorn’s second WSOP cash; his first was an 18th-place finish in the 2006 WSOP Main Event for $659,730. When play was heads-up, Esfandiari had almost a 3:1 chip lead and was raising nearly every button. It took just 16 hands for the match to be over. Esfandiari had the button and raised to 1.8 million. Trickett called and the flop came down . Trickett checked, Esfandiari bet, Tricket raised to 5.4 million, Esfandiari reraised to 10 million, Trickett tanked then reraised to 15 million, Esfandiari came over the top all-in and Trickett called. Trickett turned over the for a flush draw and Esfandiari had trip fives with . Trickett was the player at risk with his 36 million on the line. The turn was the and Esfandiari stayed in front. There was a long pause as everyone waited for the last card which came — the . Esfandiari jumped up into the air, tossed his glasses on the table and ran over to embrace his friends and family in the audience. And the “crazy idea” of a million dollar buy-in event is not only a reality, it is now in the history books. PokerNews has all the hands for you and so much more so make sure you check out our live reporting blog for all the details on this epic event.